Fresh, vibrant, alive and mystical all on each canvas at Gina Gallery in Tel Aviv, Israel. Naive artists from around the world are exhibiting their work for a month. Brilliant colors evoke peace, charm and whimsy only a Naive Artist can create. Magically, music lifts off the canvas and wafts into your imagination as you smile. “A Breath of Naive Air” is open in Tel Aviv from January 7, 2010 to February 26, 2010. The exhibit includes Naive artists from Europe, Central and South America, Canada and Israel. Included in the exhibit is Dutch artist, Anneque Lijnkamp Truyen, who delights with the ladies along the river playing musical instruments. Her story brings a sense of joy and freedom to play loud, laugh at all times and dance, dance, dance until you drop. 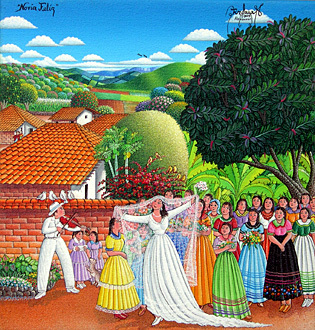 Honduran artist, Roque Zelava Acosta, introduces The Happy Bride to tell the story of the true luxuries of life available to everyone- love, romance, music and lush landscapes. Charlotte Lachapelle from France brings to life all of the magic of childhood toys lost in a dark attic. Take a break to visit and enjoy. Each artist has a flare for color and story telling bringing dreams into reality. Tags: A Breath of Naive Air, Anneque Lijnkamp Truyen, Gina Gallery, Honduras, Israel, Naive Art, Netherlands, Roque Zelava Acosta, Tel Aviv. Bookmark the permalink.